Like Chairman Kaga, Brillat-Savarin is a somewhat odd fellow, and his book follows suit, ranging from "the inconvenience of obesity," to digestion, to indigestion, to food's effect on dreams, and so much more with a smattering of food attitudes, anecdotes, and recipes to boot. "Yet Brillat-Savarin’s investigations into food and eating went beyond even that. Sure, he wanted to know how food is related to health. But in what way — precisely — is it related to pleasure, beauty, passion, truth and human happiness? We’re still trying to puzzle all that out." "Those who have been too long at their labor, who have drunk too long at the cup of voluptuousness, who feel they have become temporarily inhumane, who are tormented by their families, who find life sad and love ephemeral...they should all eat chocolate and they will be comforted." When thinking about diet, or sitting down to dinner, it often strikes me that comfort, and for that matter, pleasure, beauty, passion, truth, and human happiness, is at least as important as nutrition. After all, how you eat is an essential expression of who you are. And often, this expression has little to do with what you eat. A cupcake eaten with joy is superior to a bowl of brown rice eaten with penance. Good food, eaten with good company, inspires an inner joy so simple and sustaining that even a tiny olive fulfills. Without this joy, the most wholesome food can seem tasteless and unsatisfying. "The knowledge and understanding of all that relates to man as he eats. Its purpose is to ensure the conservation of men, using the best food possible." But what is the "best food possible?" We are so often assailed with answers to this question--kale! no wait, collard greens!--that we have little space to answer the question for ourselves. Even then, our personal answers are bound to be idiosyncratic and contradictory. Each person's relationship with food is much too complicated, much too idiosyncratic, to yield to platitudes. The concept of a nourishing diet is not homogeneous. Diet is varied and exciting. When we engage with food, we enter a conversation with our body, of course, but also our culture, environment, and emotions. Ideally, this conversation is nourishing. Perhaps, then, for our own sanity, the question is better re-stated. Before we worry about the "best food possible," why not consider the food we are eating now? Whatever you eat, is it possible to make the experience more nourishing? I believe so. Now, of course, there are no rules for eating. And yet, there are timeless, proven techniques that can dramatically improve your relationship with food—whatever you eat. The oldest eating edict is also the simplest: eat only when hungry. And yet, if you’re like most people, you might overeat some of the time or all of the time. Ideally, you’d only eat when hungry; likewise, you’d eat just enough. Another study, at the Pennington Biomedical Research Center, discovered that a calorie restricted diet in non-obese people results in less oxidative cell damage, which is directly linked to aging. The research indicated that people who eat a calorie restricted diet might live longer than people who overeat. To conquer over-eating, you might start by asking yourself a simple question: "Am I hungry right now?" If you are not hungry, why do you feel compelled to eat? The answer to this question strikes to the core of our emotional relationship with food. In my view, we eat when we are not hungry because we are seeking nourishment. But nourishment is not always about food. This is why fasting can be such an arduous practice: It forces us to seek nourishment beyond food. And this is why fasting can be so illuminating: It compels the imagination. "You got very hungry when you did not eat enough in Paris because all the bakery shops had such good things in the windows and people ate outside at the tables on the sidewalks so that you saw and smelled the food…Then the best place to go was the…Luxembourg museum where all the paintings were sharpened and clearer and more beautiful if you were belly-empty, hollow-hungry. 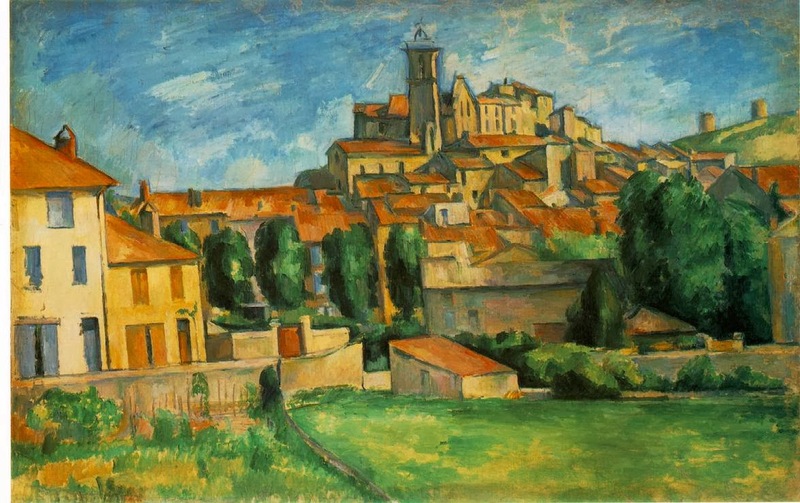 I learned to understand Cézanne much better and to see how truly he made landscapes when I was hungry. I used to wander whether he were hungry too when he painted; but I thought possibly it was only that he had forgotten to eat. It was one of those unsound but illuminating thoughts you have when you have been…hungry. Later I thought Cézanne was probably hungry in a different way." Denied food, Hemingway sustained himself with Cézanne's paintings. 1. Consume more vegetables and fruits—beginning or ending a meal with a raw salad can be especially helpful. Also, keep in mind, juicing or blending a fruit or vegetable changes the nature of the fiber; whole fruits and vegetables are more satiating than juices or smoothies. 3. Again, Pritchford offers great advice: “Set aside a special time and place for meals in a relaxing environment with pleasant sounds, aromas, colors, and conversation.” Remember to sit down. 4. Breathe deeply and chew each bite food thoroughly (see below). 5. Experiment with brief periods of fasting or cleansing (see below). Eating begins with the act of chewing. Digestion begins in your mouth. Chewing, we use our tongue and teeth to turn large pieces of food into smaller pieces; additionally enzymes from the salivary glands begin to break down food molecules. This is why nutrition experts advise you to eat slowly, and to chew your food thoroughly. The majority of your digestive enzymes are actually in your mouth. Chewing your food longer allows these enzymes time to work. If you’re feeling anxiety or stress at meal time concentrate on your chewing—chewing will calm you; chewing will open up the experience of your food: the aromas, tastes, and textures. To practice chewing, trying actually counting your chews at the beginning of a meal: 30-50 chews per bite. It also helps to set down your silverware between each bite. Is it reasonable to live a life chewing each bite of food 30-50 times? I don't think so. But the practice, attempted perhaps once per meal, can help to train you and your body to slow down, to savor each bite. Fasting can be a gentle break from our everyday habits. It need not be dramatic. Dr. Weil, the well-known natural medical doctor, has experimented with fasting one day a week as a physical and psychological discipline. During that day, he’ll drink only juice or water. Fasting advocates also believe that, freed of the burden of digestion, the body will work to purge toxins from the system. Medical science does not support this belief. However, it is accepted that the digestive system does require a great deal of energy; when not digesting food our body works to repair its own tissues. “Cleansing” is a relative term; it is generally meant to mean the purging of excess toxins and residues. Cleansing might be achieved in many ways; a fast is one method of cleansing. Others might include: enemas, cleansing kits, or extreme flushes. I will explore fasting and cleansing in detail in a few weeks. I’ve personally followed a routine of intermittent fasting for a decade or more. Instead of fasting for a day, I fast for hours each day. Most people might do this inadvertently, but most of us also snack and nibble throughout the day between meals. For me, the key is to not eat anything between meals, for a period of 12-14 hours or more. My personal practice is quite simple: I skip breakfast. By skipping breakfast, I create about 15 hours (from about 9:00 PM the previous night to 12:00 PM that day) when I do not consume food. The “morning elixir”--the term was coined, to the best of my knowledge, by Paul Pritchford--refers to a morning cleansing drink. Often, upon awakening, we are thirsty but not hungry; often, too, our stomachs are empty, and we might benefit from a cleansing elixir. Depending upon your constitution, typical elixirs might include: purified water, herbal tea, warm broth, vegetable juices, greens drinks, noni juice, or fresh lemon juice in purified water. My preferred morning elixir is inner-ēco™ Coconut Water Probiotic Kefir, a probiotic drink. Less detoxifying: Warming teas like ginger, mint, spice, cinnamon. Vegetable broths. Water with lemon. Moderately detoxifying: Vegetable juices. Fruit juices. Wheat grass or wild blue-green algae powder in water. More detoxifying: Root teas like dandelion, burdock, or chicory. Flower teas like chamomile, orange blossom, or red clover blossoms.